CISTER researcher Luis Miguel Pinho gave an invited talk in the Safety Critical Systems Workshop that took place in June in Granada, Spain. He presented the results of research done at CISTER on the challenge of timing analysis for high-performance parallel systems. The talk included an overview of the current and future challenges posed to critical applications due to the unpredictable interactions in parallel platforms, as well as the work performed by CISTER to address these challenges, done in the scope of the P-SOCRATES FP7 project. 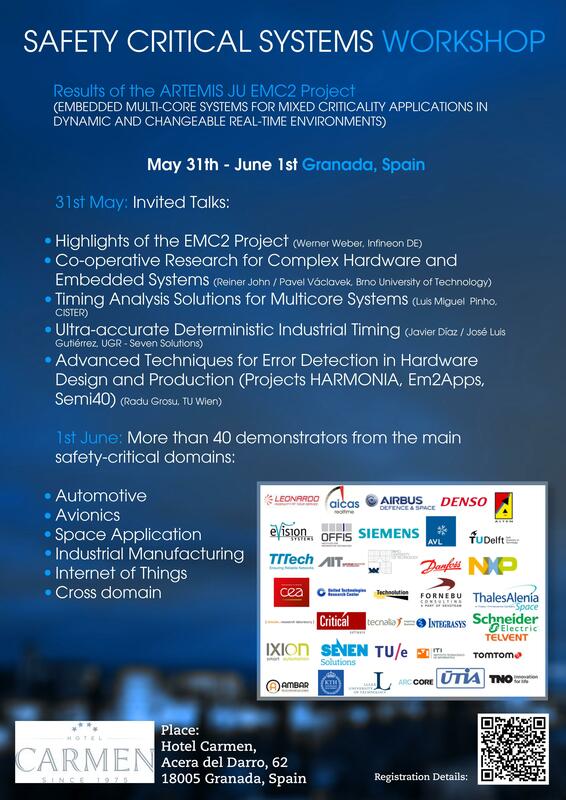 The talk was organized by the EMC2 European Project, with representatives from around 100 European institutions, both academic and industry in audience. The workshop included a set of invited talks and more than 40 demonstrators of technological developments in safety-critical domains from institutions in Europe.